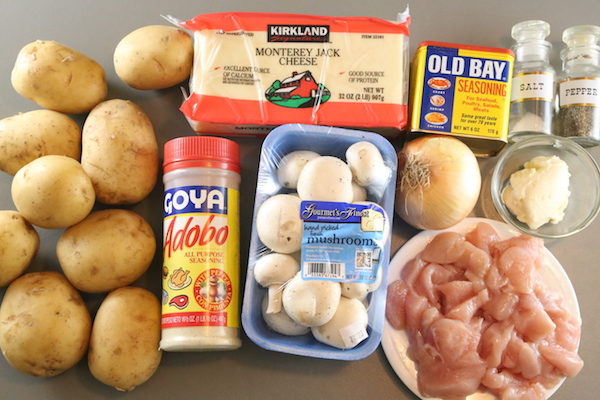 This potato, mushroom and chicken skillet recipe is a KEEPER! When we were over our friends house in SC, I discovered a new Skillet Baked Potatoes dish that tasted remarkably delicious. There’s something about the semi-creamy texture of this dish and the taste just makes it even more incredible! After some frying, the ingredients are tossed together and then baked to tenderness. It re-heats very well (she served this second day and it was VERY good.) I seriously advise you to try this potato dish! Already shared this with both my mothers (mom-in-law too) and hope you will enjoy this dish as much as I did! 1. Separately saute the onion, mushrooms and chicken in a lightly greased skillet until nicely browned. Sear the potatoes over medium high heat until potatoes release a little sweat (about 10 minutes). 2. Place everything (including remaining ingredients) into a large bowl and toss to combine. 3. Bake covered in a pre-heated 350 degree one for 1 hour. Separately saute the onion, mushrooms and chicken in a lightly greased skillet until nicely browned. Sear the potatoes over medium high heat until potatoes release a little sweat (about 10 minutes). Place everything into a large bowl and toss to combine. Bake covered in a pre-heated 350 degree one for 1 hour. Thank you, it really is. You add all the seasoning when you combine the other ingredients right before baking.